When most people hear the word “tuna,” they automatically think of the little cans of tuna available at the supermarket. However, what they don’t realize is that tuna—and specifically yellow-fin tuna—are some of the strongest fish out there. They are often referred to as a “ball of muscle” by those who fish for them and if you ever have the chance to fish for tuna, you’ll quickly see why. They are known to put up one heck of a fight, as they can grow to be up to 200 to 300 pounds each. It provides a big challenge to those who try to catch them. Yellow-fun tuna have football-shaped bodies, and as you would expect after hearing their name, they have mostly dark blue, brown, and yellow colors on them. They feed on things like squid, crustaceans, and other smaller types of fish, and while they don’t jump out of the water very often, they are powerful and fast when you consider their size. They swim among dolphins and larger schools of fish as they move through the water. If you’re going to fish for yellow-fin tuna, you’re going to need to go to deeper waters to do it. Off the coast of Cabo San Lucas and the Pacific side of Los Cabos, they prefer to swim in very deep waters. They can be found in the area throughout the year, but in general, they prefer to be in water that ranges from 74 to 82 degrees. 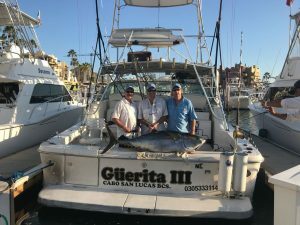 It’s usually best to go on a guided fishing tour with a company that knows what they’re doing if you want to increase your chances of landing yellow-fin tuna on your next trip.